- - - - - - - - - - - - . 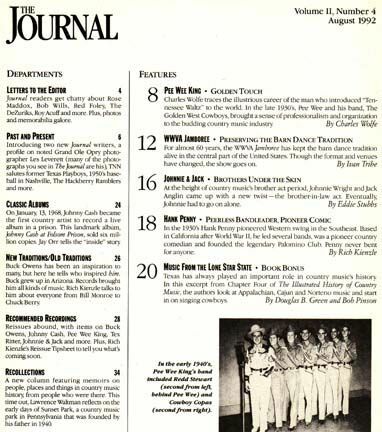 10 Volume II, Number 4 Aug-92 THE JOURNAL .
. 4 LETTERS TO THE EDITOR . .
. . Journal readers get chatty about Rose Maddox, Bob Wills, Red Foley, The DeZuriks, Roy Acuff and more. Plus, photos and memorabilia galore. . .
. 6 PAST AND PRESENT . .
. . Introducing two new journal writers, a profile on noted Grand Ole Opry photographer Les Leverett (many of the photographs you see in The Journal are his), INN salutes former Texas Playboys, 1950's baseball in Nashville, The Hackberry Ramblers and more. . .
. 8 PEE WEE KING - GOLDEN TOUCH By Charles Wolfe . . . Charles Wolfe traces the illustrious career of the man who introduced 'Tennessee Waltz' to the world. In the late 1930's, Pee Wee and his band, The Golden West Cowboys, brought a sense of professionalism and organization to the budding country music industry . .
. 12 WWVA JAMBOREE - PRESERVING THE BARN DANCE TRADITION By Ivan Tribe . . . For almost 60 years, the WWVA Jamboree has kept the barn dance tradition alive in the central part of the United States. Though the format and venues have changed, the show goes on. . .
. 16 JOHNNIE & JACK - BROTHERS UNDER THE SKIN By Eddie Stubbs . . . At the height of country music's brother act period, Johnnie Wright and Jack Anglin came up with a new twist-the brother-in-law act. Eventually, Johnnie had to go on alone. . .
. 18 HANK PENNY - PEERLESS BANDLEADER, PIONEER COMIC By Rich Kienzle . . . In the 1930's Hank Penny pioneered Western swing in the Southeast. Based in California after World War II, he led several bands, was a pioneer country comedian and founded the legendary Palomino Club. Penny never bent for anyone. . .
. 20 MUSIC FROM THE LONE STAR STATE - BOOK BONUS By Douglas B. Green and Bob Pinson . . . Texas has always played an important role in country music's history In this excerpt from Chapter Four of The Illustrated History of Country Music, the authors look at Appalachian, Cajun and Norteno music and start in on singing cowboys. . .
. 24 CLASSIC ALBUMS by Jay Orr . . . On January, 13, 1968, Johnny Cash became the first country artist to record a live album in a prison. This landmark album, Johnny Cash at Folsom Prison, sold six million copies. Jay Orr tells the 'inside' story . .
. 26 NEW TRADITIONS/OLD TRADITIONS by Rich Kienzle . . . Buck Owens has been an inspiration to many, but here he tells who inspired him. Buck grew up in Arizona. Records brought him all kinds of music. Rich Kienzle talks to him about everyone from Bill Monroe to Chuck Berry . .
. 28 RECOMMENDED RECORDINGS by Rich Kienzle . . . Reissues abound, with items on Buck Owens, Johnny Cash, Pee Wee King, Tex Ritter, Johnnie & Jack and more. Plus, Rich Kienzle's Reissue Tipsheet to tell you what's coming soon. . .
. 34 RECOLLECTIONS by Lawrence Waitman . 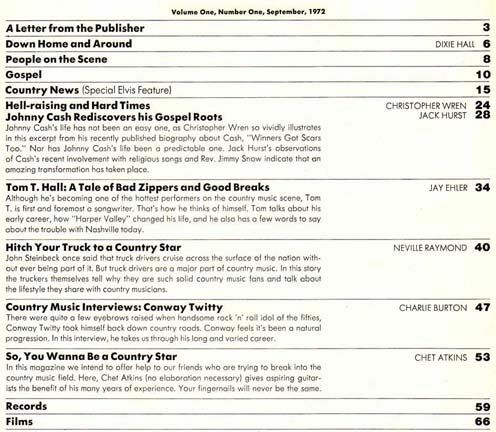 . . A new column featuring memoirs on people, places and things in country music history, from people who were there. This time out, Lawrence Waitman reflects on the early days of Sunset Park, a country music park in Pennsylvania that was founded by his father in 1940. . .
- - - - - - - - - - - - - . . . .